AS IS STANDARD IN THE INDUSTRY, SPECIAL ARIPEX 2018 ROOM BLOCK IS HELD ONLY UNTIL JANUARY 16, 2018, ONE MONTH BEFORE THE SHOW (FEBRUARY 16-18, 2018). We have contracted for the absolutely lowest rate offered by the hotel from any source. If a lower rate is subsequently offered by the hotel, by contract, that new lower rate will be passed along to all ARIPEX reservations without exception. If you contact Marriott Central Reservations directly by telephone and do not book using the DIRECT LINK ABOVE, please mention you are making a reservation for Aripex 2018 out of the Marriott PASSKEY group booking system. If you are arriving early or staying late you can receive the same discounted rate for those additional nights. Shuttle Service: The hotel has contracted a shuttle service from the airport. The $17 service is through Super Shuttle. You can book your reservation online at www.supershuttle.com. 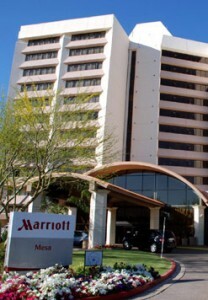 If one desires to upgrade to the Marriott concierge level, the rate is $179. This rate is available between February 14 and February 19, 2018. If you desire additional room nights before 2/14/2018 or after 02/19/2018, please contact the Show Chairman, Mr. Kevin A. Lesk, at 480.240.0388 to help assist you with your additional room night requests outside of our room block. Spacious guest rooms, heated pool and whirlpool spa, fitness center, fine dining, and lobby bar available to all guests. Maximum occupancy of each guest room and suite bedroom is four (4) persons.